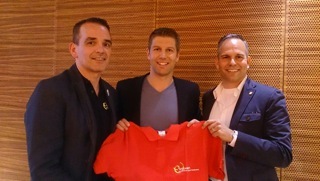 EGLSF Co-President Klaus Heusslein and EuroGames Committee Member Lou Manders (former EGLSF Co-President) met Thomas Hitzlsperger at the debate 'Is Homosexuality in Sport still a Taboo' which had been hosted by the Dutch Embassy at Berlin in June . Hitzlsperger reported to have experienced his coming-out as liberation, especially when he finally felt able to talk with his friends and family about his sexual orientation. He considers such a step as important since it also can enhance performance of athletes. And he added: "Lying is unpleasant!" Unfortunately there still are unpleasant experiences in sport and particularly in football, some of the other participants of the panel made ​​it clear. Compared to the Dutch Football Association, who participated with their own boat at the Amsterdam Canal Pride, the German FA (DFB) should do more, especially within their own organisation, was demanded by all. Simply signing a „Berlin Declaration“ without an effective follow up is not enough. It remains the task of the society and of politics to create a more open atmosphere here, added the SPD politician Dagmar Freitag.